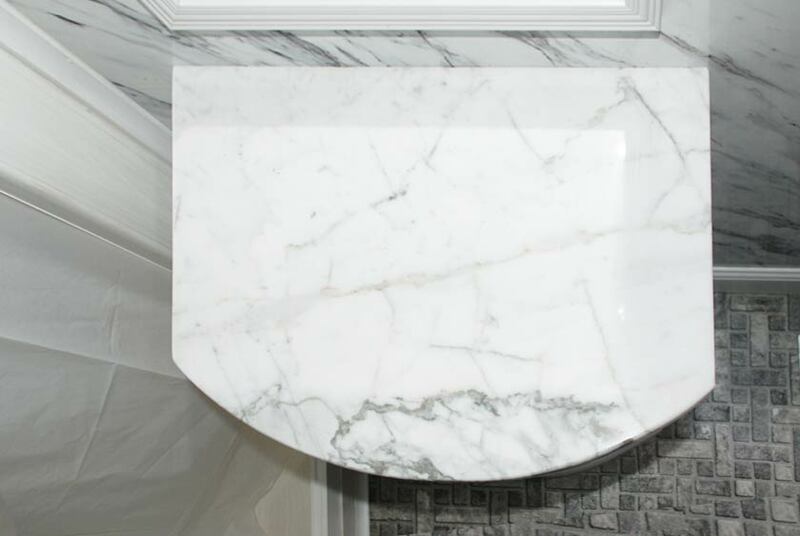 The interior details include Faux statuary marble walls with wood trim work throughout. 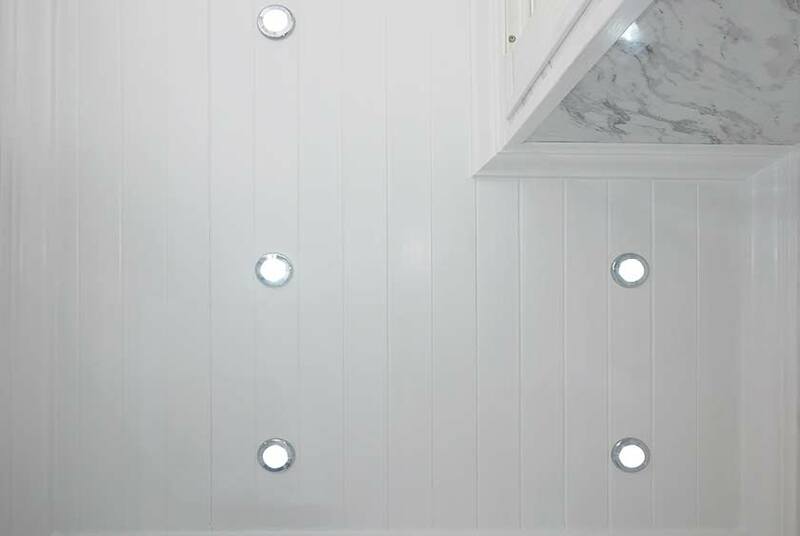 A white painted wood wainscot ceiling has 8 LED high-hat lights for plenty of light inside the restroom. 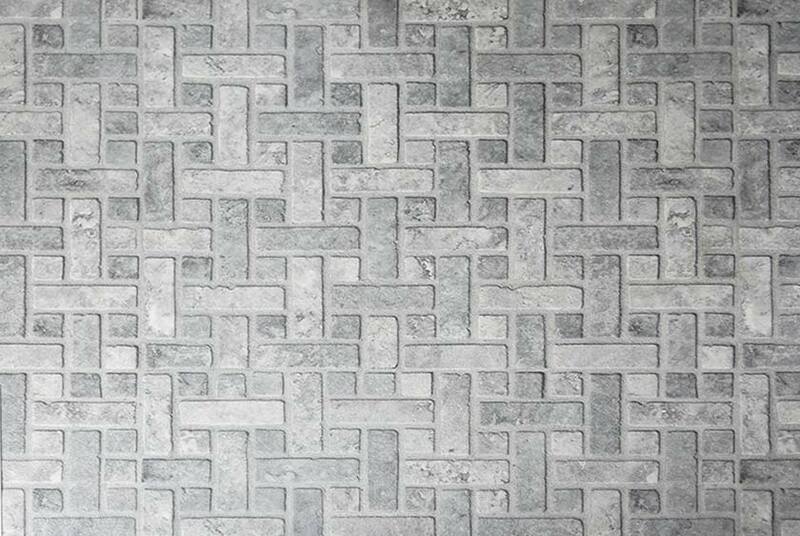 Beautiful faux mosaic tile ﬂoor adds to the restrooms homelike design. 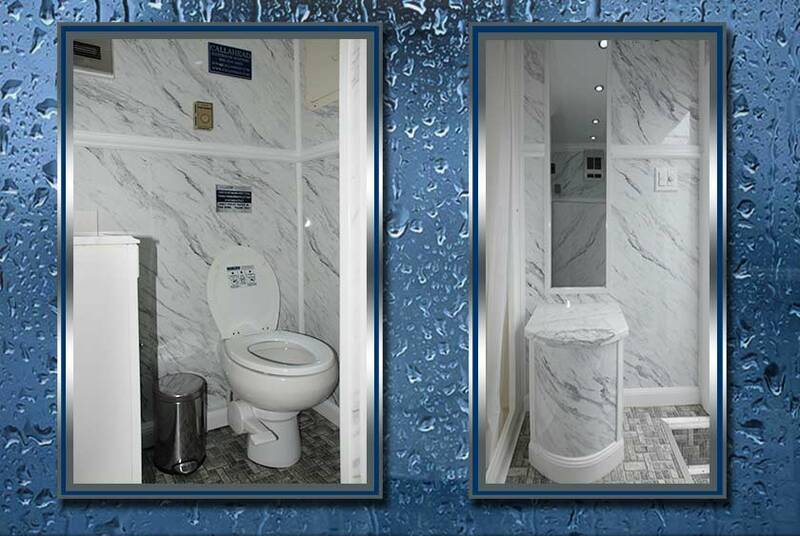 For comfort and convenience, there is a statuary marble bench seat directly outside the shower. 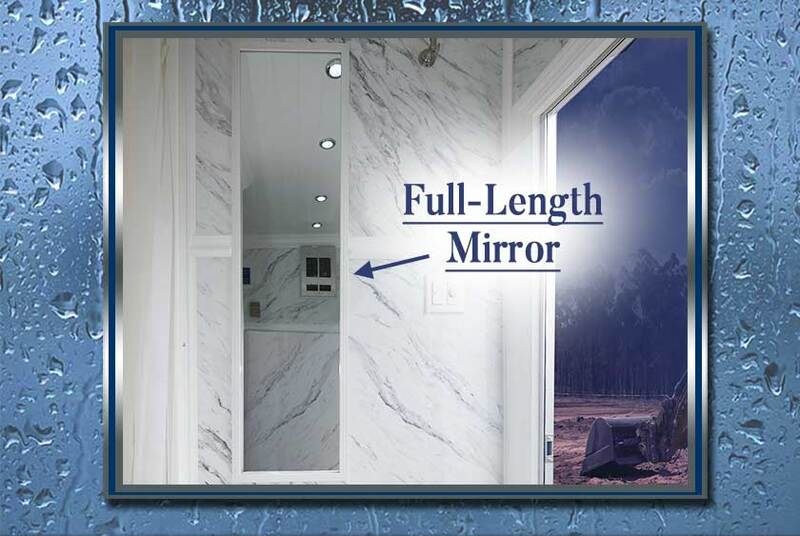 Also, near the shower area, is a brushed nickel towel and robe hook and a full-length mirror. 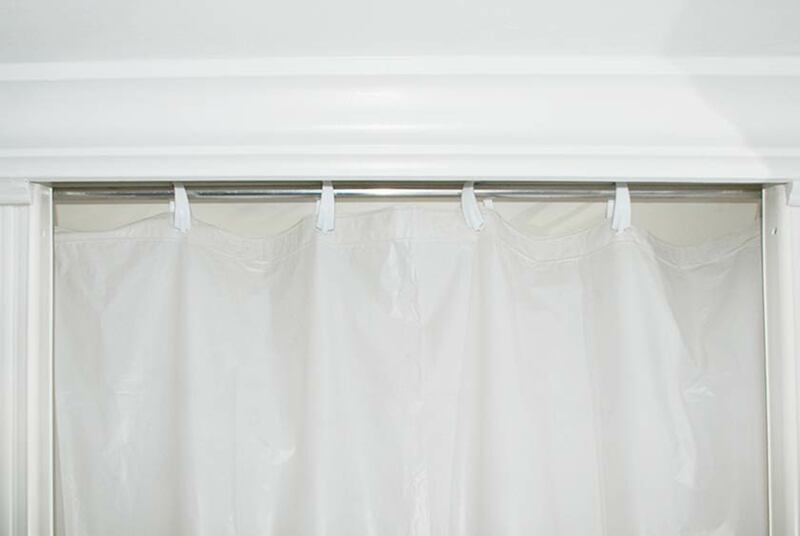 The stall shower has a traditional shower curtain for privacy and eliminates water spray outside the shower stall. 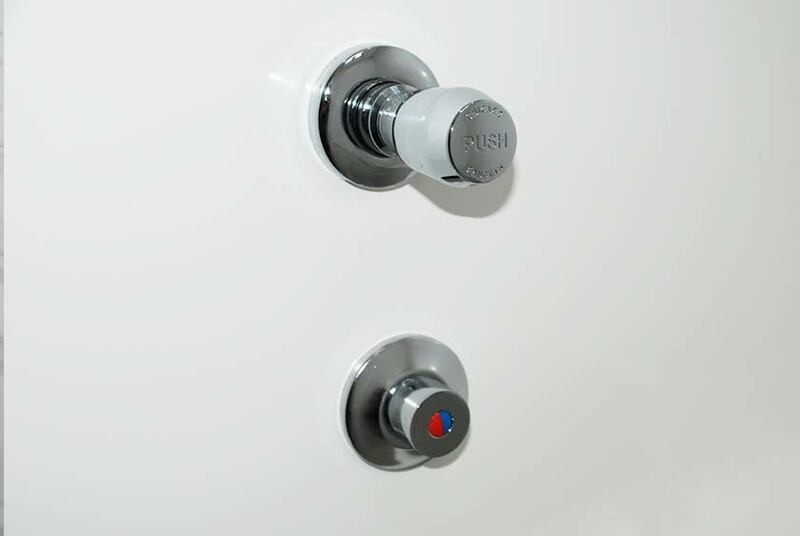 A Chicago push button water valve delivers hot and cold running water which is adjustable to a shower temperature of your choice. 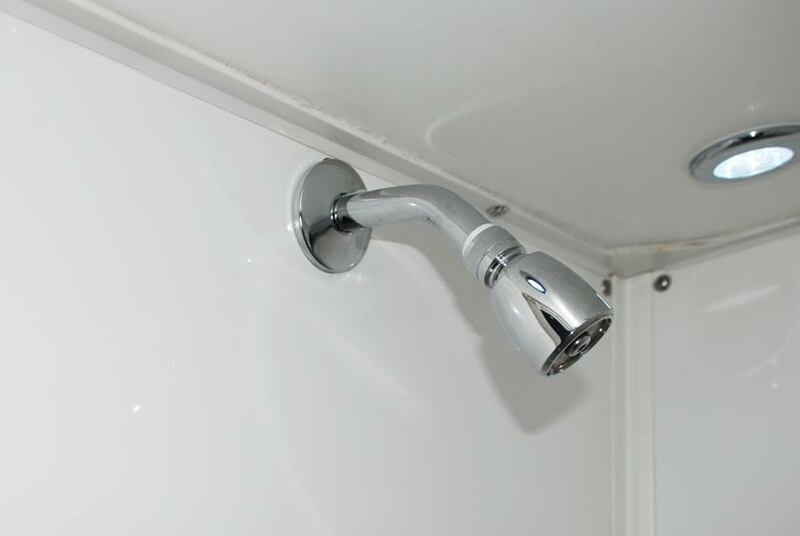 The chrome showerhead is properly located directly above the water valve. 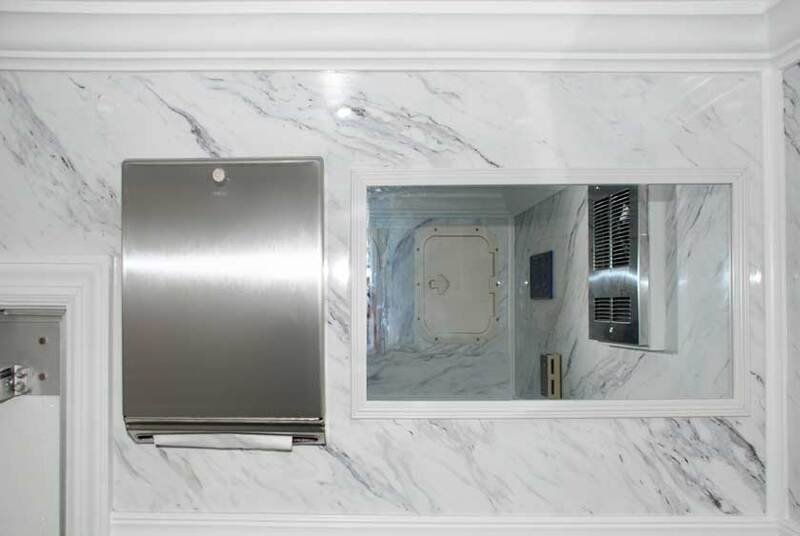 Conveniently located are the shower's soap tray and separate shampoo holder. 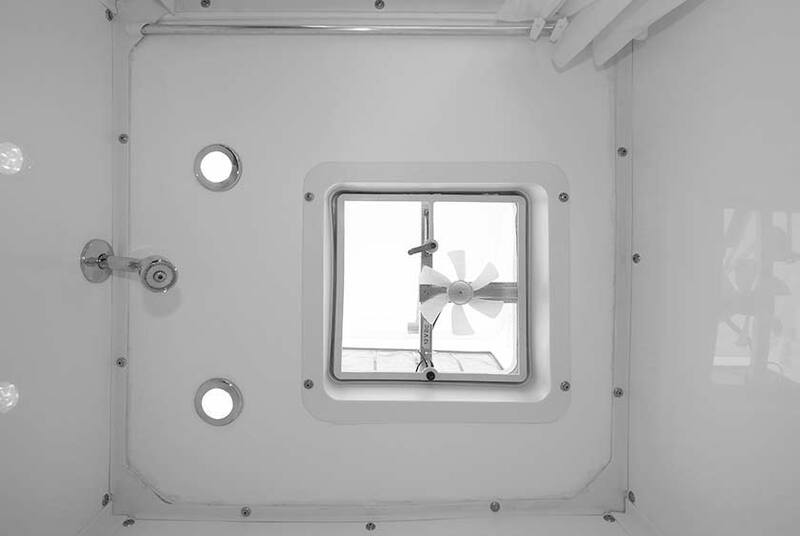 A ceiling installed exhaust fan inside the shower helps eliminate moisture and humidity inside The WATERFALL Shower Head. A Dometic low-ﬂush porcelain toilet bowl has a foot operated ﬂushing system for easy hands-free operation. 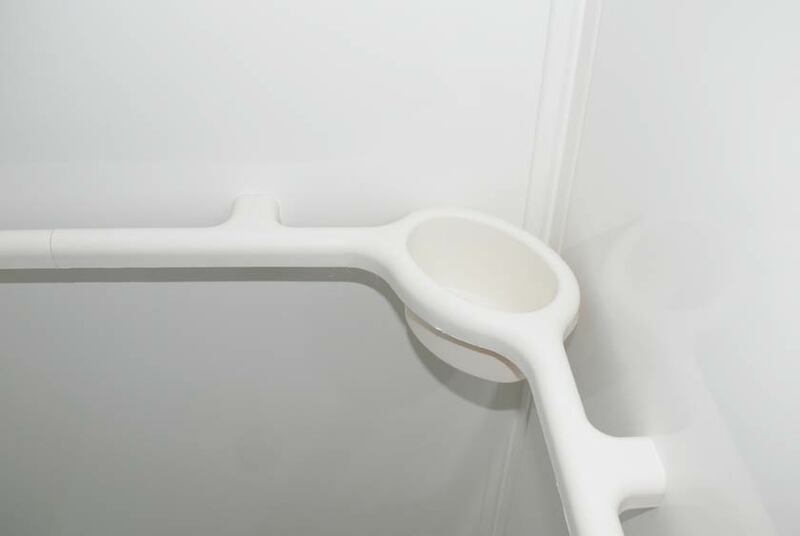 A toilet paper holder is properly wall mounted next to the toilet bowl. 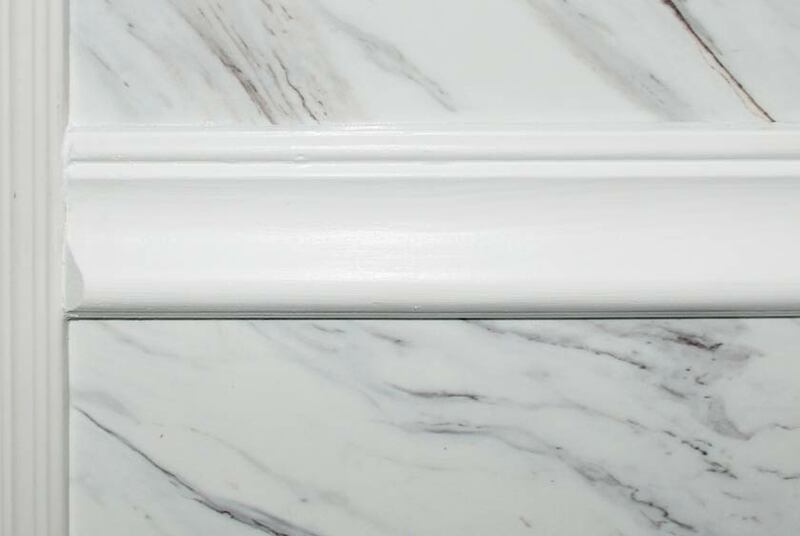 A wood cabinet vanity has a statuary marble shelf with a porcelain sink basin. A Moen brand faucet has an automatic shut-off and also delivers hot and cold running water thanks to the Bosch water heater. 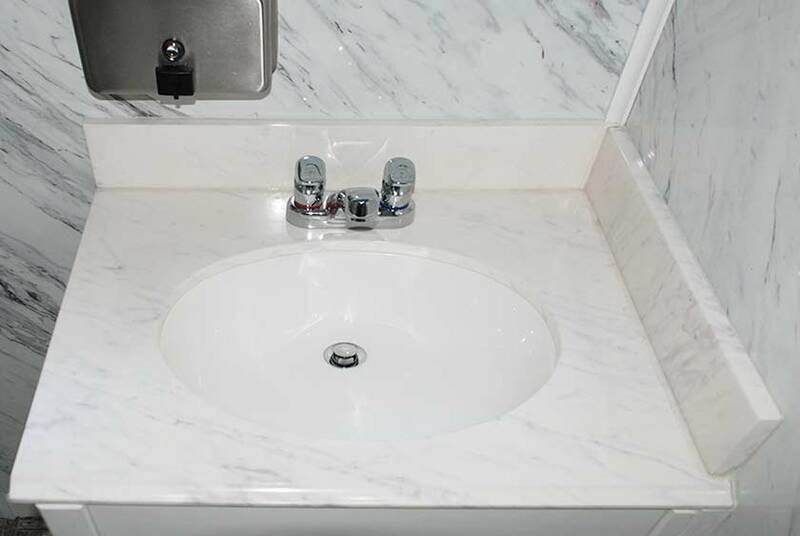 Above the sink is wall mounted soap and hand towel dispensers, a vanity mirror, and a brushed nickel towel holder ring. The WATERFALL Shower Head is built weathered tight to handle every New York season. A thermostat controlled 1500 watt fan forced Braun heater ensures warmth and comfort inside the bathroom even in the coldest winter months. 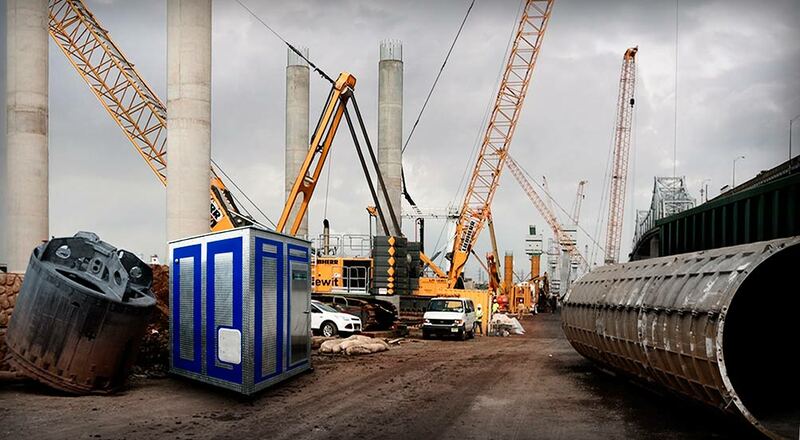 This remarkable full portable bathroom is double walled and so well insulated to operate in well below zero temperatures. The WATERFALL Shower Head is the perfect solution for any location in need of a full-sized private bathroom and does not require any water hook-up to operate. Below is a list of locations and job sites where The WATERFALL Shower Head is commonly rented and recommended. 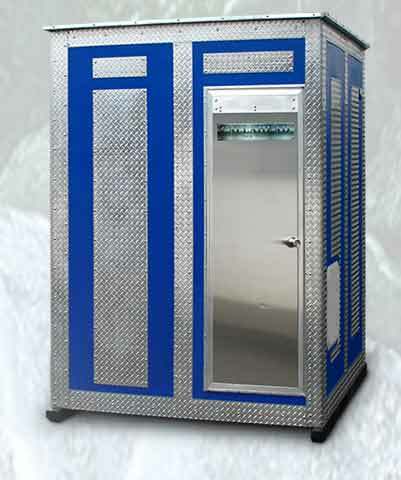 However, this homelike mobile bathroom is a perfect rental for just about any long-term location where temporary bathroom with shower facilities are needed. The WATERFALL Shower Head is constructed of high-density polyethylene marine grade plastic. It is manufactured by CALLAHEAD using only premium heavy-duty materials. 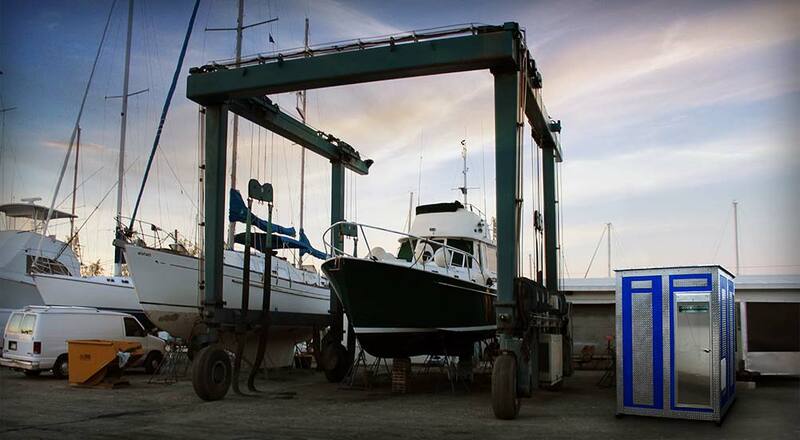 The marine grade diamond plate aluminum and built-in marine grade stainless steel fasteners provide strength and design. 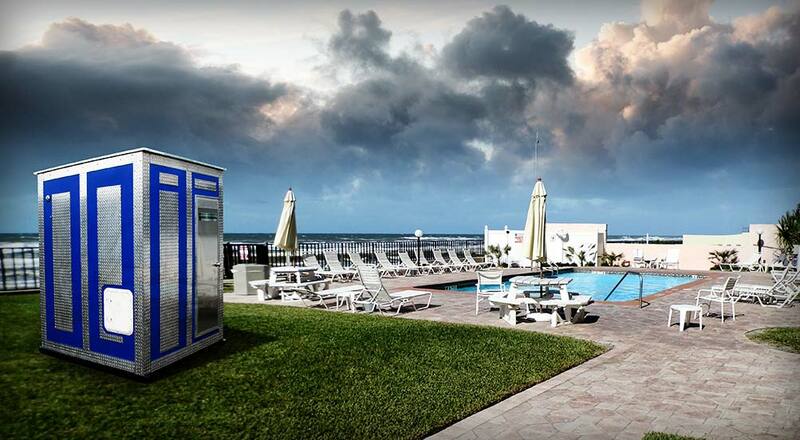 Exterior color options include Gray, Blue, Green, Orange and White to make any location look spectacular. The eye catching design of five various metals combined with its innovative operating system makes The WATERFALL Shower Head the world's most advanced portable bathroom ever created. The shower, toilet, and sink of The WATERFALL run on completely separate systems, so you never have to worry. 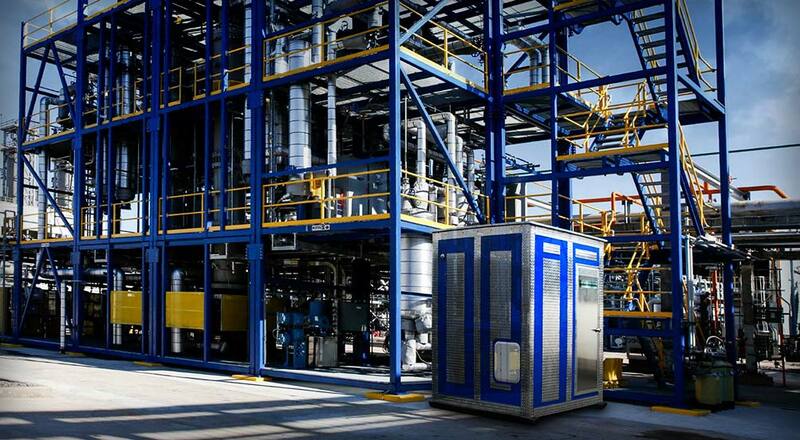 Each system has its own fresh water and waste water holding tanks and pumps working independently from each other. 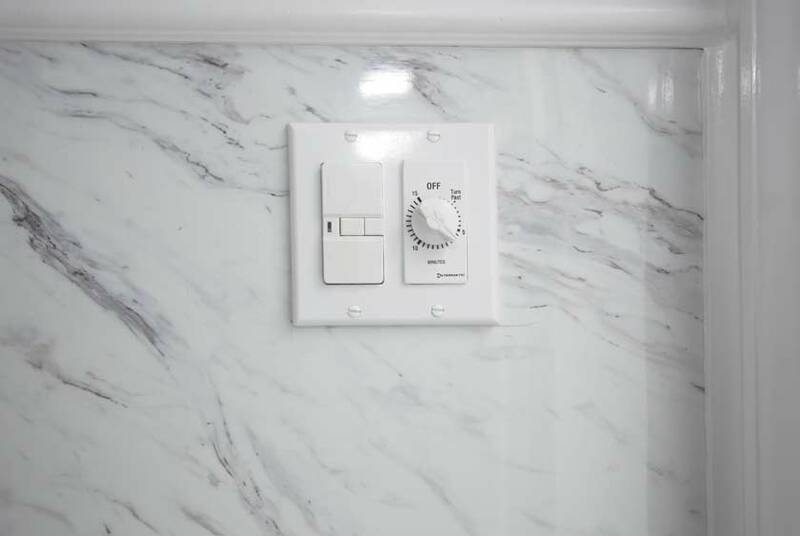 The shower has a 15-minute automatic timer to help conserve water use. 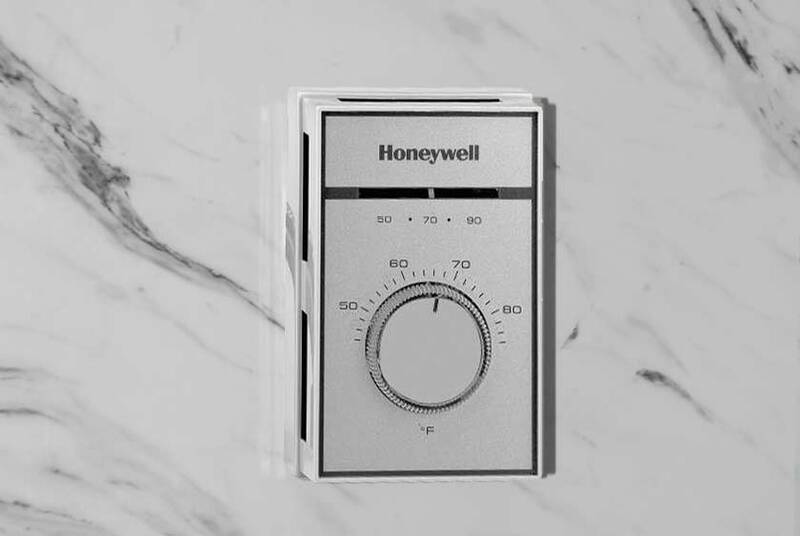 The timer may be restarted and adjusted to suit your desired shower time. The low-ﬂush toilet and auto shut off sink also assist in water conservation. The WATERFALL Shower Head is powered by two standard 110-Volt outlets or generator for convenience. It is available for delivery throughout New York City's five boroughs, Westchester and all of Nassau and Suffolk Counties to Montauk Point. 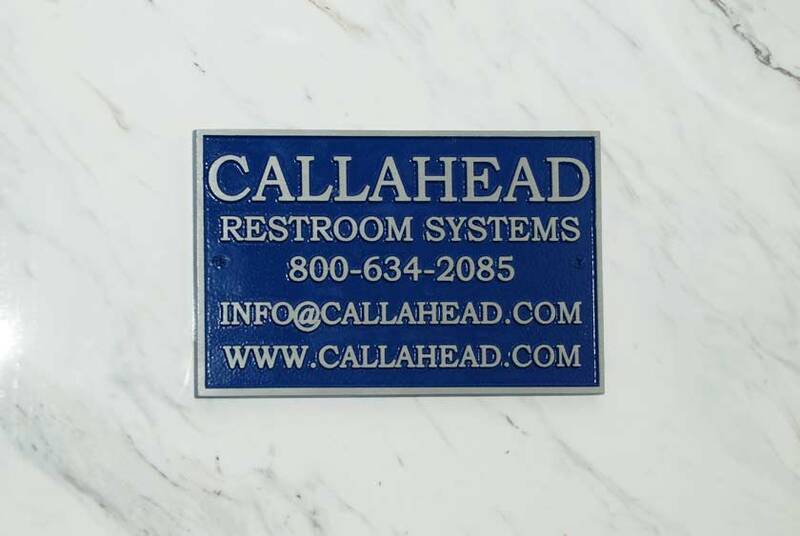 With every long-term portable restroom rental CALLAHEAD offers cleaning services daily, weekly, monthly or a cleaning service tailored to your requests. 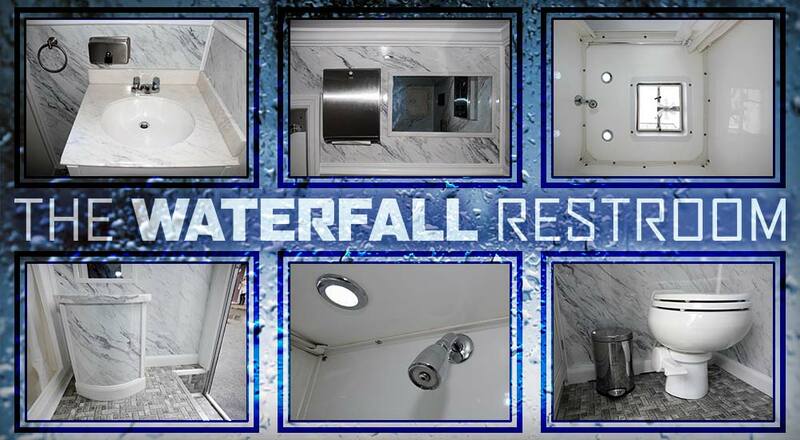 Our uniformed service technician will clean and sanitize The WATERFALL Shower Head with only hospital grade cleaners and disinfectants and refill your water supply. 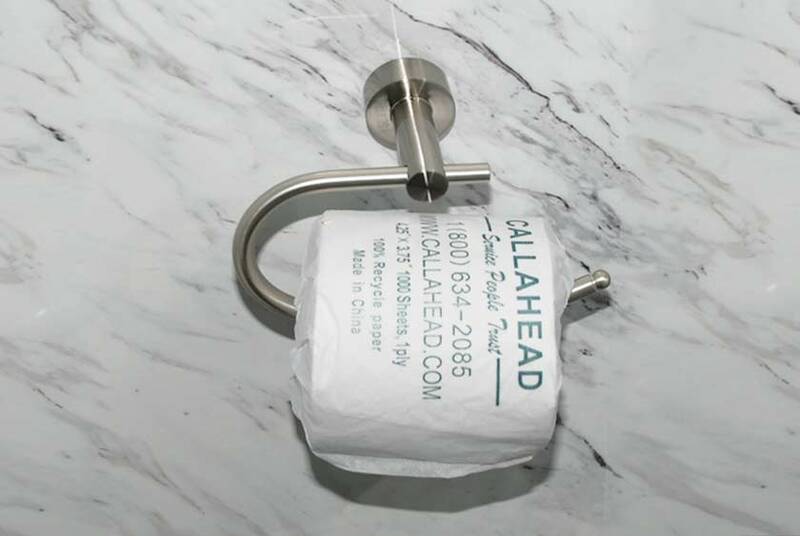 CALLAHEAD also installs a sign-in sheet in every long-term rental, so you know exactly who and when The WATERFALL Shower Head is serviced. Antiseptic Dispenser installed inside The WATERFALL Shower Head filled with our waterless hand sanitizer. Our waterless hand sanitizer kills 99.9% of germs and bacteria and meets OSHA and Health Department requirements for sanitary protection. 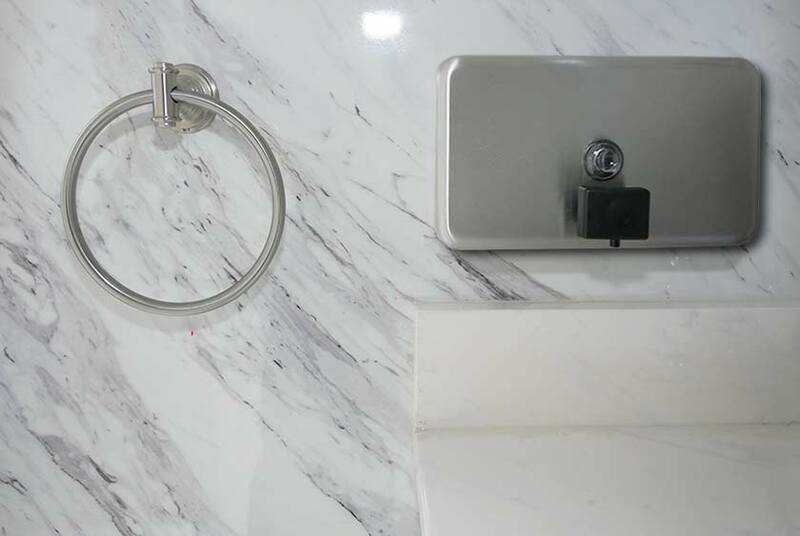 The antiseptic dispenser supplies approximately 900 - 1300 applications • GoJo Hand Cleaning Dispenser is installed in The WATERFALL Shower Head and filled with the #1 heavy duty GoJo hand cleaner. GoJo hand cleaner is popular among auto mechanics for its ability to break down grease and grime easily. GoJo Hand Cleaner has become widely popular with construction workers and contractors to remove acids, cement and other solvents from hands. 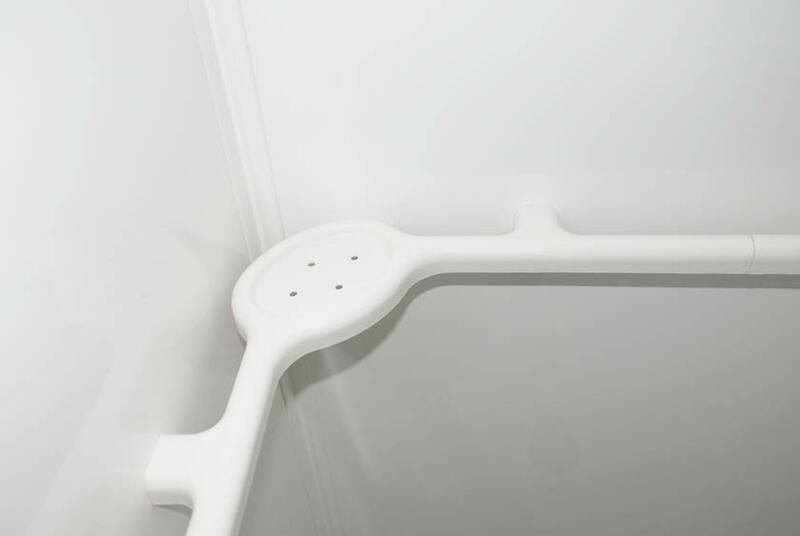 • Headliners Toilet Seat Cover Dispenser installed inside The WATERFALL Shower Head filled with 250 toilet seat covers so every user may have a clean, dry and sanitary toilet seat. • Headmist Time Released Air Freshener installed inside The WATERFALL Shower Head to release a fresh, clean scent automatically. 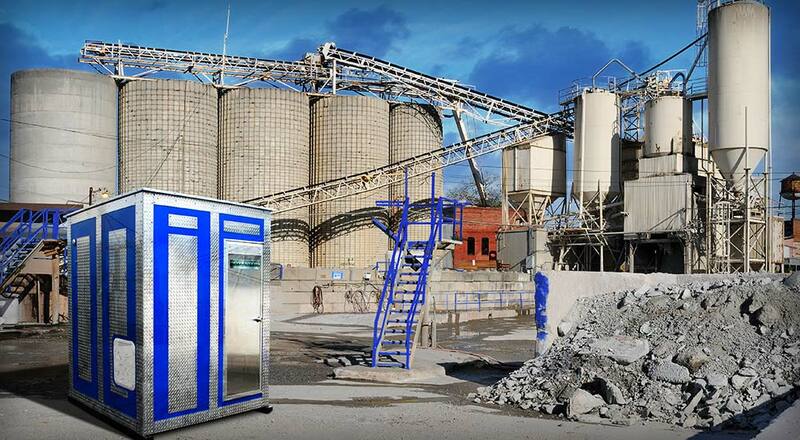 When you are looking for state-of-the-art portable sanitation equipment unavailable anywhere else, combined with service you can trust, CALLAHEAD is the only company that delivers. The WATERFALL Shower Head adds to CALLAHEAD's long list of innovations. 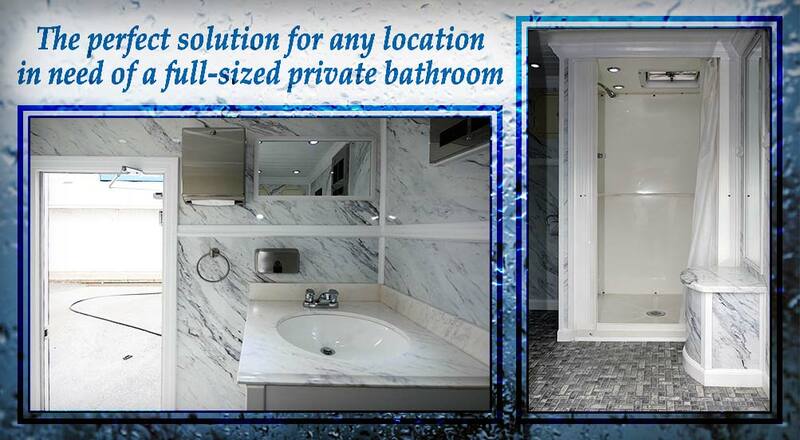 This is a customized full-service bathroom that looks and operates just like a home bathroom and the only of its kind in the industry. 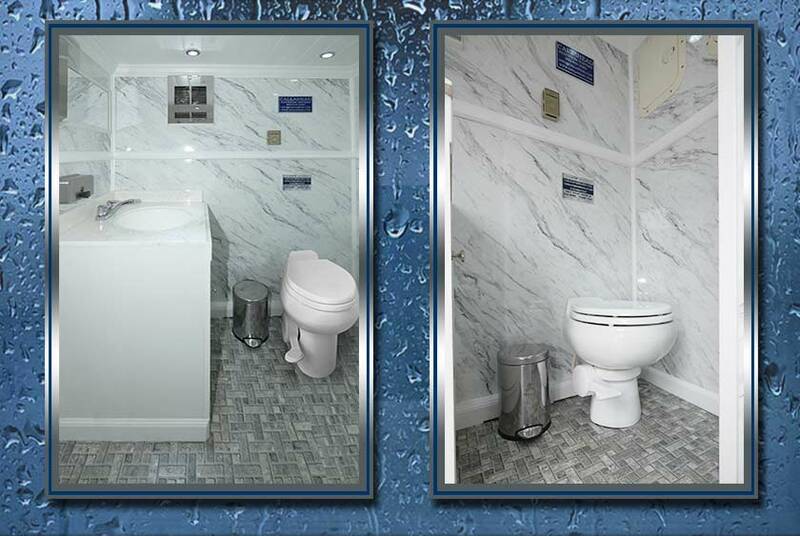 Equipped with a shower, porcelain ﬂush toilet, vanity sink and homelike design yet, completely mobile and self-contained. 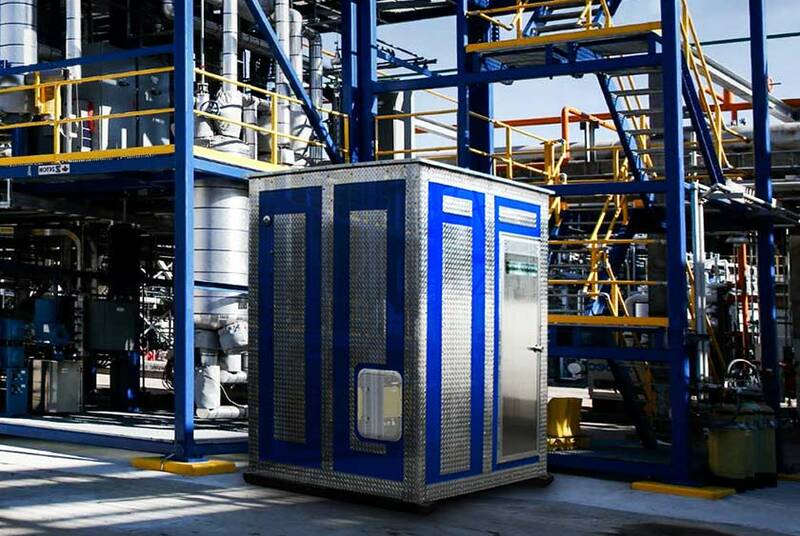 This remarkably constructed portable restroom is another innovation for the portable sanitation industry by President and CEO Charles W. Howard for CALLAHEAD. 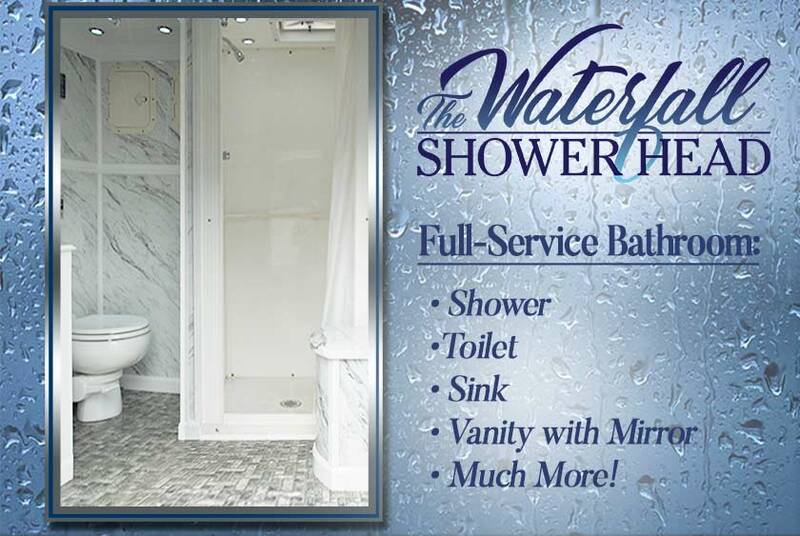 The WATERFALL Shower Head is the perfect solution for any location in need of a full-sized private bathroom and does not require any water hook-up to operate. 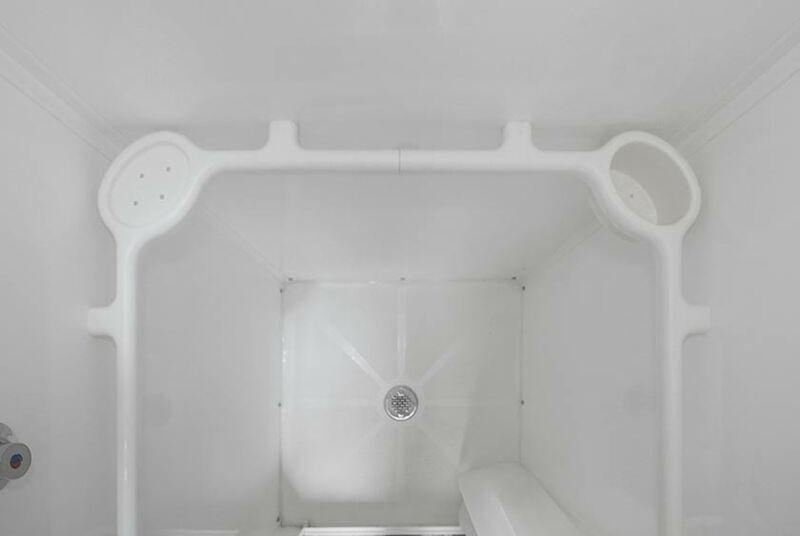 Emergency locations, construction sites, movie and film shoots, bathroom remodeling jobs, water shut-offs, pools, and beach clubs are just a few locations The WATERFALL Shower Head would benefit. Also, the very attractive, and very durable exterior looks incredible on-site. 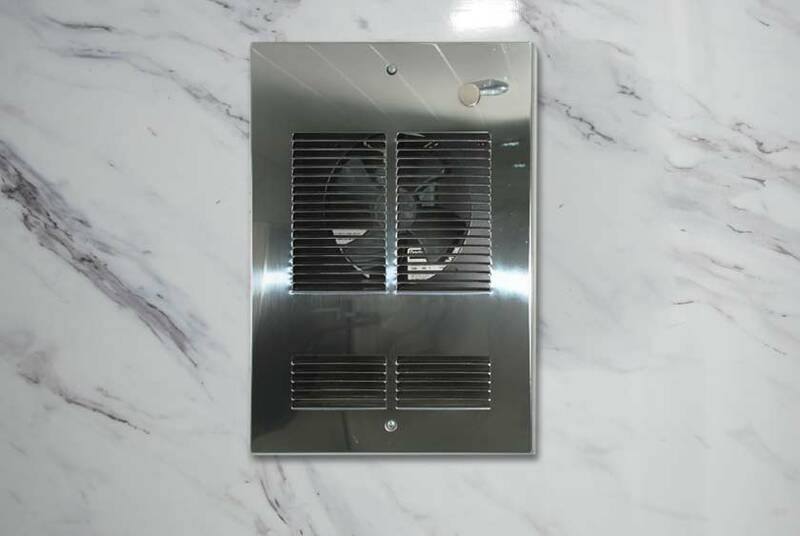 Once you open the self-closing commercial grade aluminum door and see The WATERFALL Shower Head's interior, you will think you walked into a home bathroom. 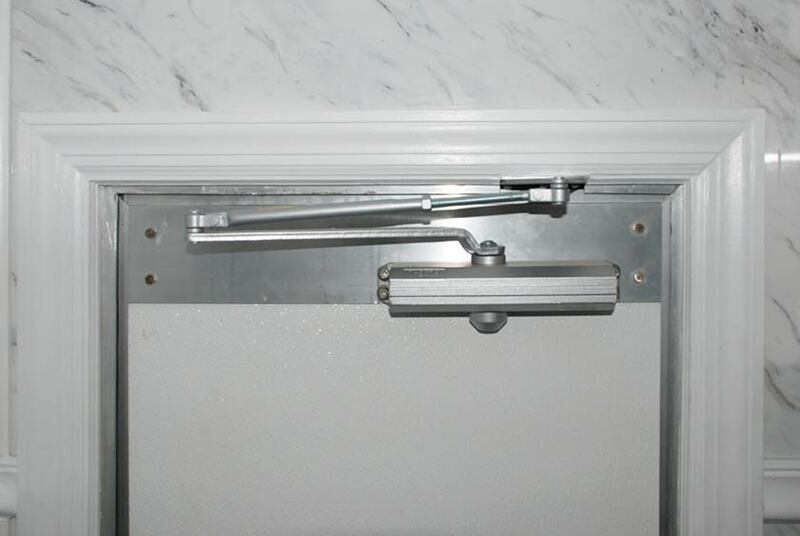 The door has a key lock entry as well as an internal locking system for ensured privacy. 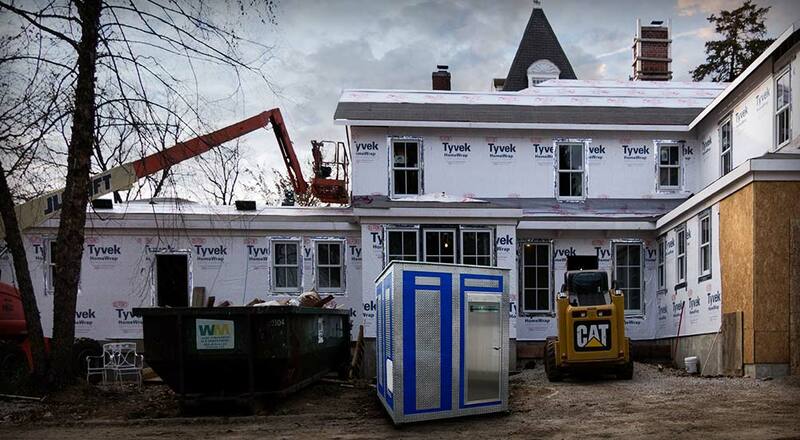 The traditional home restroom design and construction do not look or operate anything like a mobile bathroom.